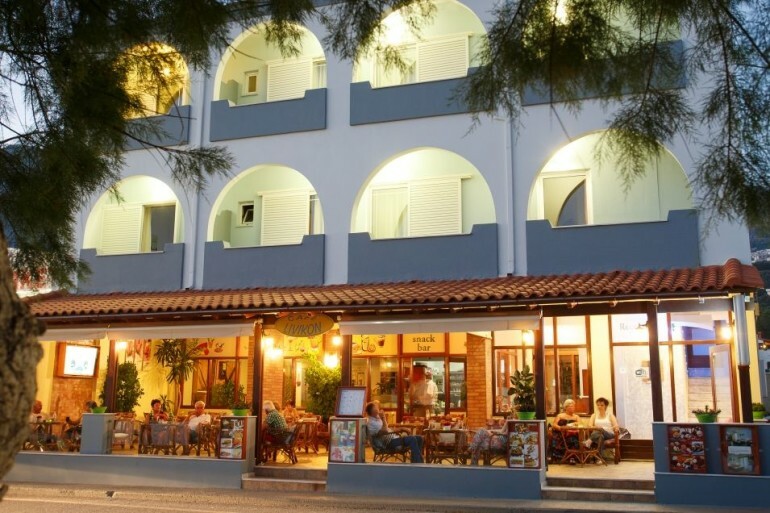 LIVIKON Beach Hotel is a cozy family run and lately renovated hotel in Plakias with 10 double and triple rooms and a penthouse. Hotel LIVIKON which is open from April to November, has got its name from the crystal clear Libyan Sea, which throws its waves on the beach 20 meters in front of the hotel. It is situated directly at the seaside of Plakias, and offers lodging with a breathtaking panoramic view on the Plakias bay with its sandy beaches, its rocky capes falling into the sea and its picturesque little harbor. All rooms have balcony with double gazed doors and window shutters, private bathroom with hair dryer, fully equipped kitchenette with fridge, air conditioning, Internet – hotspot and Sat-TV. On the ground floor there is a cafeteria – snack bar. We see cleanliness and good service as an essential factor of hospitality, which you will experience at LIVIKON Beach Hotel.